The Aircast A60 unique design incorporates a sleek stabilizer located on each side of the ankle, trusted by sports stars. Guards against ankle sprain and prevents rollover. Lightweight, breathable, fits easily into sports trainers. This ankle brace is ideal for anyone who is looking to prevent an ankle injury. What makes the A60 unique is how it provides the most support at the weakest point of the ankle, thus preventing ankle sprain. Simply stated...wearing the A60 means you're less likely to suffer from an ankle injury. I have been suffering with tarsal tunnel syndrome for the last year. I recently have gone to sports medicine and I'm going through therapy. I am a runner and a waitress and I work extended hours on my feet. This injury is very painful and I'm looking for ankle and foot support while on my feet. I have it in both feet the right is worse than the left. Can you please recommend the right brace! So I can continue working and running without pain! My daughter has suffered now 2 stress fractures of the navicuiar bone in her foot. The doctor recently has said it is due to her weak ankles. Her ankles often give out and interfered with her running form with her trying to compensate for them not giving out which is what they say has caused her fracture. She is a pole vaulter and we are looking for a brace that she can wear in her spikes to help with supporting her ankle that will fit and not be bulky . She already wears ankle braces for volleyball but they will not fit comfortable in her track spike. We are just needing something to hopefully give her ankle a little more support and help them both from giving out. She is also in pt right now to help strengthen them. Would this be a good one or would you suggest another? Thank you for your question. The A60 will offer the most support of the braces we have that will fit in track spikes. If this option does not work she may want to have her ankles taped for practice and meets. I had a total reconstruction on my ankle a year ago and I have been dealing with trying to rehab it so that it is not painful to walk or do my job. I am a Personal Fitness Trainer and I have used a tie up brace as well. My job is very physical and demanding. It has been getting somewhat better and I love to cycle. I have been told that I will need to fuse my ankle and I have bone on bone. I need something that will help in keeping me pain free. I tried the Don Joy Velocity brace and could not stand it. Very uncomfortable. Any suggestions?? I used to be quite active with backpacking, sprint tiathlons, cycling, etc. but a few years ago my lower lumbar was fused and I have problems with stability/balance on my right ankle due to lower back nerve trauma and muscle weakness in my leg. It has been impoving but after walking awhile the ankle becomes fatigued and less supportive. Would the Aircast A60 or another model of ankle support be of any value to give me more stability and extend my time walking? The A60 offers light to moderate support. It is an excellent brace for a little added support. If you are looking for something with moderate support I would recommend one of the DonJoy Stabilizing braces, and for simi-ridged support you may consider the AirCast Airsport ankle Brace. I hope this information helps you out. If you have any more questions please don't hesitate to ask. I am a dancer, and I used to play volleyball and basketball. I run quite often and I've sprained both my ankles multiple time, I have had a few stress fractured and torn ligaments. I need an ankle brace that will be able to fit inside my jazz shoes and that will be flexible so that I can still point my toes and move comfortably during class. Would you recommend this brace? 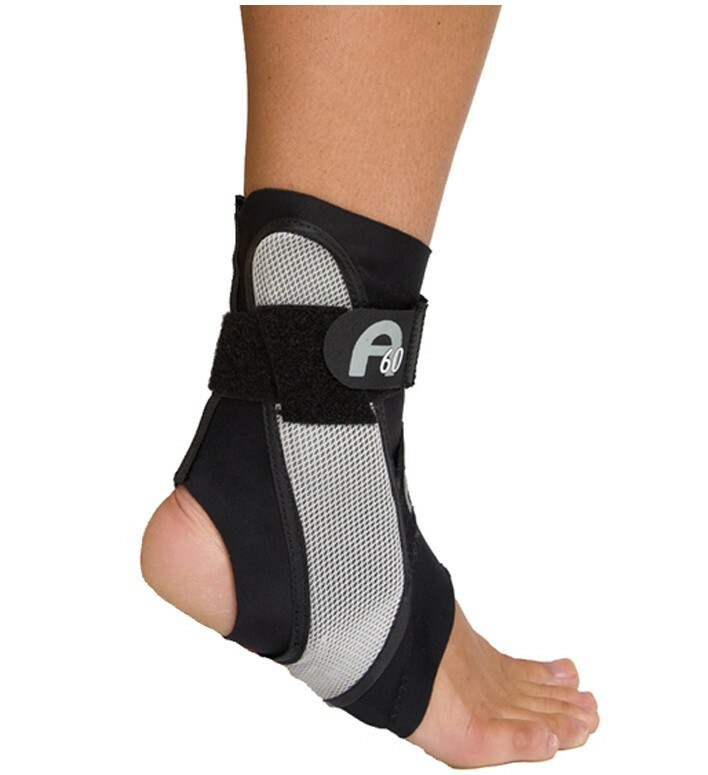 The a60 is your best choice, it's the most streamline brace we have that provides ankle support. It has a medial and lateral rigid support. Material is made of spandex, the portion that surrounds your foot. Does this support kid's shoe size is 5.5? Our Pediatric Version of this brace would be a Size (XS). Take a look at the Airsport, this brace is offered in a XS. I am a ballet dancer, I sprained my ankle a week ago. Now I am looking for a brace and support my any ankle when I walk or dance. You think Aircast A60 is better or Aircast Airsport is better? I recommend the Airsport for walking, and athletics. It provides maximum support to the ankle. It may be restrictive for Ballet, depending on the level you are involved in. Here are some options for you when you return to ballet and only need mild support. I had surgery for a torn Achilles about 16 weeks ago and have just completed physical therapy. I am 63 years old, an active golfer and looking for some support for my left ankle. I am a right handed golfer. Will the A60 provide support when shifting through the swing for the outside ankle. Yes the Aircast A60 will support the outside of your ankle during your golf swing. It is designed with medial and lateral rigid uprights to support your ankle during that motion. Aircast AirSport, DonJoy Stabilizing ankle, DonJoy Rocketsoc. Janet, thank you for taking the time to email us here at www.betterbraces.co.uk regarding your Ankle Injury and getting the best Ankle Brace for your condition. Our Donjoy Velocity Ankle Brace is the best on the market for joint stability and will assist you in keeping your ankle from rolling in and out while walking. I am an obese female with larger than average ankle and calf and am prone to at least moderate swelling on a daily basis. I am three months post severe ankle sprain ( and tibial plateau fracture). The air splint my orthopod gave me is molded for ankle curves I don't have and cuts into my foot and ankle, adding to my pain. I've just started full weight bearing and find I am still in need of moderate support. This brace is advertised as preventative. But, will it serve as support for a recovering sprain as well? Also, will it stretch to comfortably fit a larger ankle and lower leg? The A60 is intended for prophylactic or light support. It would not be appropriate for your stage of healing. More appropriate braces include the Air-Stirrup Universe, Velocity, or RocketSoc ankle braces. I am confident in recommending the Aircast A60 to anyone looking for excellent ankle support. My A60's never leave my gym bag. Great product! !